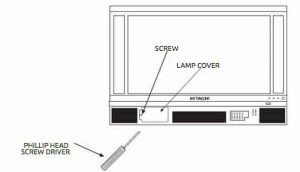 When it’s time for a new Hitachi 50V720 TV lamp, use this guide to help you through the installation. 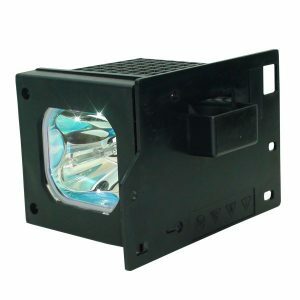 Your Hitachi 50V720 TV lamp is a easy to install. The Hitachi 50V720 needs a Hitachi UX21517 TV lamp. The lamp life will vary based on how much you use the TV. Turning it off and on frequently may shorten the lamp life. 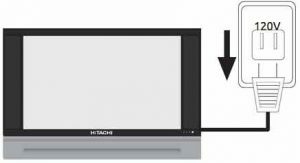 When it’s time to replace the Hitachi UX21517 TV lamp, the LAMP INDICATOR on the TV panel will turn on and stay on. This is different when it blinks along with TEMP light after the Hitachi 50V720 TV is turned on. When it’s time to replace the lamp the LAMP INDICATOR will not turn off. Another indication of end of lamp life is when the TV picture turns dark or the color looks off. Do not open lamp compartment or attempt to remove the Hitachi UX21517 unless it’s being replaced. Switch off the power and unplug the Hitachi 50V720 power cord. 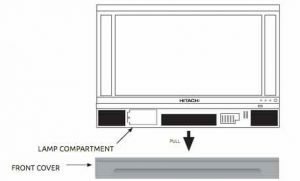 If the lamp is in use when failure occurs or if the lamp has exploded, wait at least 30-45 minutes for the Hitachi UX21517 lamp to cool before opening the lamp compartment or touching the lamp assembly or any broken pieces. Broken lamp pieces can cause injury. Handle with gloves to avoid cuts. Do not place any foreign objects inside the lamp compartment. You can get burnt. MOST IMPORTANT: When replacing the lamp, let it cool down completely, for approximately 30 to 45 minutes after the power has been switched off and A.C. cord has been unplugged. Turn off the main power switch and unplug the power cord. Wait at least 30 minutes to allow the lamp to cool down before replacing it. CAUTION: The lamp is very hot and may cause fire or severe burns. Wait until the Hitachi UX21517 is cool to the touch before replacing it. Remove the front cover from the TV set. This is held by snap on. Pull the cover outwards until the quick snap on disengages. The Hitachi 50V720 TV lamp contain mercury and should be properly recycled. Remove the screw securing the Hitachi 50V720 TV lamp cover with a Phillips head screw driver. Remove the lamp cover. 4. Remove the two screws that hold the Hitachi UX21517 lamp in place. Remove the old Hitachi UX21517 lamp unit by holding the lamp handle. Pull outwards taking care not to catch your fingers. DON’T PUT YOUR HAND into the Lamp Storage Area after the lamp is removed. You can get burnt. 6. Install the front cover back in by aligning it properly. Snap on to quick connect and then then push inwards holding the left and right side of the front cover until you hear a snap. Push the other snap on gently to make a good fit. Tighten the screw. NOTE: If power is connected before the Lamp Cover is installed, the power will be off and the Lamp Indicator will flash. 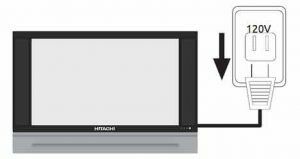 Be sure to turn OFF the TV before replacing the Hitachi UX21517 lamp. Double check the front cover since the TV will not turn on. Learn tips to extend lamp life of the Hitachi UX21517 lamp. ‹ Lumens: How much does your projector need? Where is the led lamp located ina hitachi tv model number 50VS569A . I am not familiar with that Hitachi model. Is there another model number on the TV? Do you have the associated series number, i.e. 50V 800 series? Sorry I can’t help you any further.